Think of this sticky toffee honeycomb cake as the gooey, elevated cousin to sticky toffee. Ahh, sticky toffee pudding. It’s Kate Middleton’s favorite-ever holiday dessert, and with good reason. The British sponge cake is made with dates and drenched in toffee sauce and vanilla ice cream, taking decadent to a whole new level. 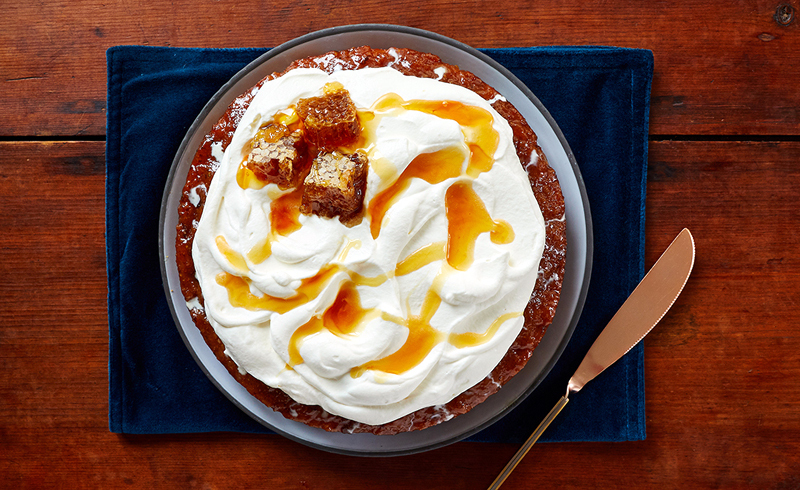 We’ve given this classic recipe a new-school makeover: Think of sticky toffee honeycomb cake as the pudding’s gooey, elevated cousin. 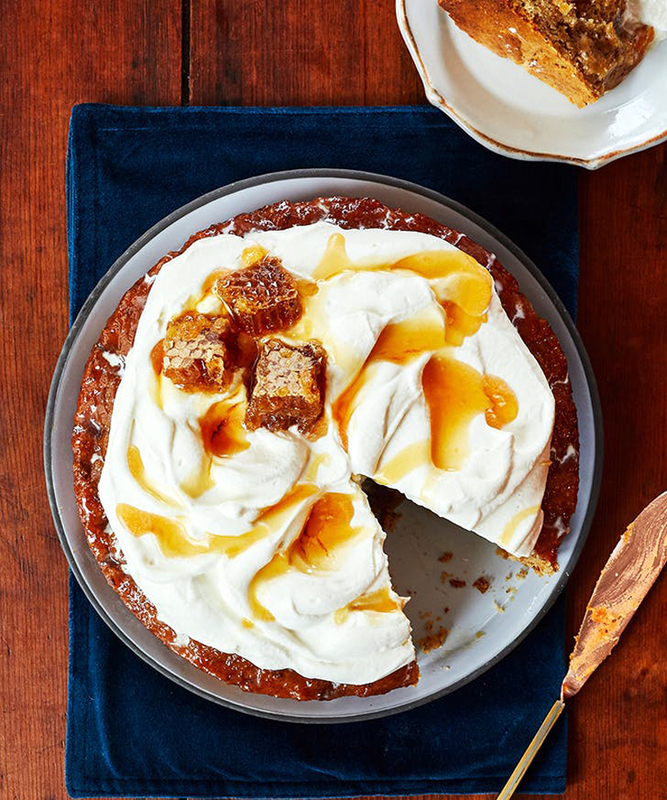 “The honeycomb and butter combine in the base of the pan to create a thick, honey-flavored caramel on top of the cake,” says the recipe’s author, Erin McDowell. Enjoy it slightly warm, slathered with unsweetened whipped cream and a few drizzles of honey for good measure. 1. Preheat the oven to 350°F. Generously grease a 9-inch cake pan with 2 tablespoons (28g) of the butter. Grease the base and side, but the majority of the butter coating should be in the base of the pan. 2. Use a sharp knife to cut the honeycomb into ¼-inch-thick pieces. Some parts of the honeycomb may be firmer and slice easily, while others may fall apart—don’t fret! The goal is just to end up with an even layer of honeycomb in the base of the pan, so arrange them however needed to get an even layer in the base. 3. In the bowl of an electric mixer fitted with the paddle attachment, cream the remaining 1½ sticks (142g) butter with the brown sugar, honey and orange zest until light and fluffy, about 5 minutes. 4. Add the eggs one at a time and mix well to combine, scraping well after each addition. Add the vanilla and almond extracts and mix well to combine. 5. Add the flour, almond flour, baking powder, cinnamon, sea salt, baking soda and cloves; mix to combine. Scrape the bowl well, then add the sour cream and mix until well incorporated. 6. Gently pour the cake batter into the prepared pan and spread into an even layer. Transfer to the oven and bake until the cake is evenly golden brown and a toothpick inserted into the center comes out clean, 55 to 65 minutes. 7. Let the cake cool in the pan for 15 minutes. Place a cooling rack on a foil-lined baking sheet. Invert the cake onto the cooling rack (some honey caramel may run out; spoon it back onto the cake, if desired). 8. Just before serving, whip the heavy cream to soft peaks. Apply all over the surface of the cake, and then finish with drizzles of honey and a honeycomb garnish, if desired. If the cake is still warm, the cream touching the surface of the cake will melt slightly (in a really delicious way). For a less messy version, allow the cake to cool completely before adding the whipped cream.